Rolex watches are famous the world over. They combine beauty and elegance and they are some of the most expensive watches on the planet. As a result, very few people are able to actually purchase one new. Luckily, it is possible to also find a preowned Rolex, but you have to make sure that it has been properly maintained so that it is actually worth your money as, even second hand, these watches cost quite a bit. It will have been worn regularly, as this keeps the lubricants in the various pieces soft. It should, at the very least, be wound once a week even if the user didn’t wear it anymore. 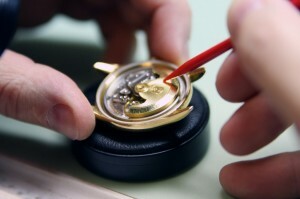 It should be cleaned properly by a professional watch service. Dirt on a Rolex is very clearly visible, whether it is on the bracelet, the case, the bezel or the Cyclops lens. It is best if it is cleaned by a professional regularly, although some home maintenance can be done as well. So long as the crown was secured properly and lukewarm water was used to clean it, the watch should be fine. Any scratches should be removed from the watch bracelet. This is particularly true in the Oyster model, which has a truly polished look. The bracelet should be polished regularly to keep the clean, crisp look that Rolex is so well known for. If you see a preowned Rolex with a scratched bracelet, you should ask the owner to knock a bit of money off because it will mean that the piece was not looked after properly overall. You can have it fixed professionally, but this will cost a bit of money. Every Rolex, with the exception of the Oyster Quartz, are self-winding. The power reserve is around 48 hours, after which the watch will stop running. You can then manually wind it up. However, it is better to make sure the watch never stops completely. If it does, it may be more difficult to start it back up again and many people have a tendency to shake it, which could damage the inside. If you see a Rolex that has “died”, there is a chance that the previous owner has tried shaking it as well, as they have obviously not looked after it well enough to keep it running. Almost every Rolex is waterproof to 330 feet. This means that you can swim with it or shower. However, it is not a diver’s watch. Yes, it is able to cope with the pressure of water up to those depths, and it may even be able to cope with the salt in the water, but this is not recommended. You can easily recognize a water damaged Rolex by the condensation on the watch face.